From Cary: Take I40 East and exit onto Wade Avenue (towards Raleigh). From Wade Avenue, take the Blue Ridge Road exit and turn Left at the top of the exit. Take a right at Lake Boone Trail. Then take a Right onto Myron Drive. We are on your immediate left in the Meredith Woods Office Building. Park in the "back of the building" and come in to see us! From Cary: Additionally, you could continue on Wade avenue where it intersects with I-440 East, take I-440 East to Lake Boone Trail. You'll turn right off of I-440, and right onto Lake Boone Trail ("doubling back" under I-440), left onto Myron Drive and left again to our office parking lot. 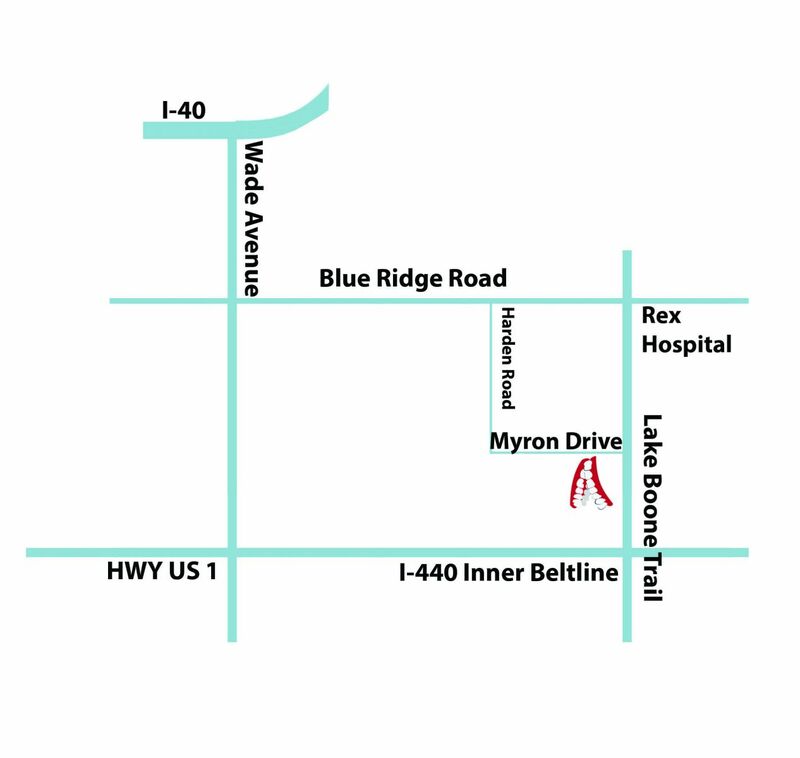 From Apex: From US1 South, Take the Lake Boone Trail exit after US1 transitions into I-440. At the end of the exit, turn left onto Lake Boone Trail. Then take a left onto Myron Drive. We are on your immediate left in the Meredith Woods Office Building. Park in the "back of the building" and come in to see us! From Raleigh: Coming from North Raleigh, take the Lake Boone Trail exit from I440. Turn right onto Lake Boone Trail. Then take a left on Myron Drive. We are on your immediate left in the Meredith Woods Office Building. Park in the "back of the building" and come in to see us!